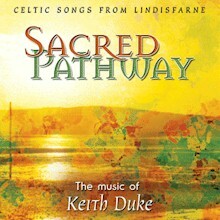 Sacred Pathway by Keith Duke was published by Kevin Mayhew in May 2004 and is our 15265th best seller. The ISBN for Sacred Pathway is 1490145. I first heard a couple of tracks from this album at a retreat weekend- came back and immediately ordered it over the internet on Eden- came within three days and I've enjoyed every minte of listening to it- great blend of Celtic and modern reflective- a little mediaeval sounding at times, but well worth the buy- moments of real peace and tranquility. Got a question? No problem! Just click here to ask us about Sacred Pathway. Now Playing: Christ be near Your browser does not support the audio element.